Issue # 66 - December 18th, 2018. CHROMiX is 20! 4.2.4 includes Ink and Subtrate reporting fixes (proper negative values when required) and in-app CMY patch display (now displaying the correct patch values). There is also a fix to spectral handling with Techkon SpectroDens over network connection. CHROMiX is 20 years old!! We will be celebrating CHROMiX's 20th year while at the PIA Color Conference in San Diego January 2019. To commemorate, we will be giving away some cool swag! Win a copy of C4 Verify or a pair of Apple AirPods. Drop your card in the fish bowl at our vendor booth to enter. Steve Upton, Pat Herold and Rick Hatmaker will be at the PIA Color Conference 2019 in San Diego coming up in January 12th to 15th. Check out the latest with our newly updated LinkedIn page. We are constantly updating this with fun and useful stuff! This months instrument focus is the Konica Minolta FD-9 scanning spectrophotometer, written by Pat Herold manager of CHROMiX technical services. The FD-9 is a fabulous device. Pat's perspective is solid since he uses the FD-9 regularly in our Seattle measuring lab. So, take advantage of our unique perspective, and enjoy the article below! Stan Lee needed G7 - The famous late Marvel Comics Man died recently. Not saying G7 could have saved him, but perhaps the color could have benefitted? Weevil not be ignored! - The Philippine Snout Weevil is a colorful little guy. January 12th -15th, 2019 - 2019 PIA Color Conference, Hilton San Diego Resort &amp; Spa, San Diego CA. This is our favorite color focused event in North America. Both Steve Upton and Pat Herold will have speaking sessions (see below). Rick Hatmaker will be at the vendor booth and generally available. Going? Save $50 and use CHROMIX50 code to get a $50 discount upon registration! 1:10 pm Steve is on a panel for 'Bring Your Inkjet Output: Verification and Troubleshooting (Part 2)', and then, at 2:20, Steve is presenting an 'Analysis of Expanded Gamut Printing'. 10:00 am, Pat Herold presents 'How to Create and Verify Profiles'. 3:20- 4:00 pm Afternoon Coffee Break, Vendor Area, CHROMiX will be sharing birthday cake with everyone to celebrate 20 years in business. Please stop in if there! February 26th - 28th, 2019 - Texttextil, Raleigh, NC. Americas only dedicated show for technical textiles and non woven materials. April 11th - 13th, 2019 - Graphics Canada 2019, Toronto International Centre, Toronto, CN. May 6th - 7th, 2019 - INFOFLEX 2019, Ernest N. Morial Convention Center, New Orleans, LA. June 20th - 26th, 2019 - ITMA, Barcelona Spain. Everything about textile and garment printing. September 24th - 27th, 2019 - LabelExpo Europe, Brussels. Largest label expo in the world. October 3rd - 5th, 2019 - Print 2018, McCormick Place, Chicago, IL. October 23rd - 25th, 2019 - Print United (formerly SGIA), Dallas, TX. An expansive and comprehensive display of printing technologies and supplies, education, programming and services. October 24th - 26th, 2019 - PhotoPlus Expo 2019, for professional photographers, photography enthusiasts, videographers, students and educators. Device Linking tool DevIL v5 makes significant advances. See more at CHROMiX. In honor of the recent eXact 4.0 release, X-Rite raised the Trade-In amount for an eXact from $550 to $750 and extended the deadline to December 31st, 2018. Call CHROMiX sales to save even more. Speaking of Measurement...: The definition of the exact mass of a kilogram is about to change. Can a company own a Pantone color? : An article written by Billie Muraben of AIGA about Cadbury's fight over Pantone color 2865c. It raises many questions for brand owners and others in the color chain of custody. From the designer perspective, we think you will find this article interesting and provocative. National Geographic: How your eyes make sense of the world: How does the eye work exactly? An interesting video. Scientists debunk the effectiveness of EnChroma glasses for colorblind people: We were a little surprised by this ourselves. Read on. There is No Such Thing as G7 Proofing Media: Tips for Updating Your Inkjet Proofing Substrate. Credit to Lynn Leppo of CGS for pointing these tips out. The FD-9 is a fairly new player in the field of spectrophotometers, having been released in 2016. Its name borrows from a series of hand-held spectrophotometers Konica Minolta has been producing for at least 6 years. CHROMiX published a review of the FD-7 back in 2013. The FD-7 is a hand-held press-side instrument that can spectrally give you density, Lab and spectral measurements. Field-attachable external filters allows for taking UV-cut or polarized measurements. The FD-9 builds on this same measuring head, and surrounds it with a high-speed sheet reader. This unit is very fast and very accurate. It's not cheap, but, if you have the need for speed and its unique ability to scan different groups of patches on the same sheet, this can be a steady workhorse for your company for years to come. Their intention is to make an instrument that is fast, accurate, and does not require a lot of user intervention. As a sheet reader, the FD-9 will accept any kind of flat, flexible material, up to 12 inches wide and as long as 1.5 meters. It is arguably the most flexible spectrophotometer on the market as far as chart layout. It can read a small control strip of 6 patches and it can read a single-row control bar from the edge of a press sheet that is a meter long. If you already have targets and charts that you have used with other instruments, the FD-9 will most likely be able to measure them with no problem. Here's how the chart selection works. 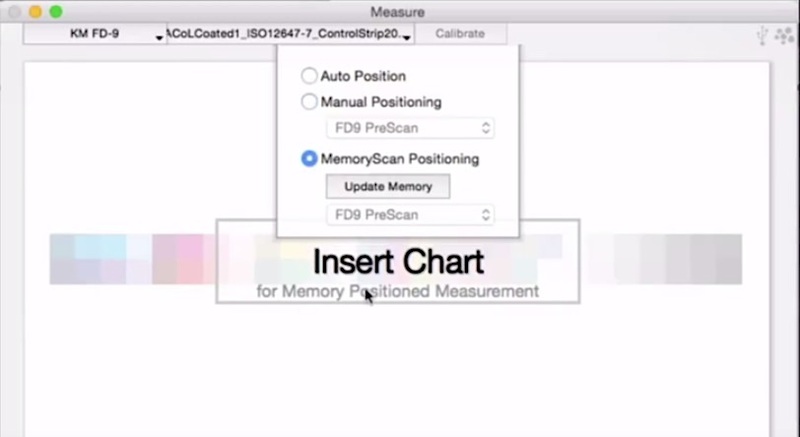 The FD-S2w software requires some setup of chart layout information ahead of time. CHROMiX software driving the instrument will need a basic reference file that defines the layout of the target you wish to measure. A target is fed into the front of the FD-9, the feed rollers pick it up and pull the entire page through the machine, it does a quick scan as it feeds the paper back out the front, and it presents the user a black and white preview of what the page looks like. In some modes, the software can automatically identify the locations of the patches to be measured and can immediately begin measuring. In other modes, the user uses the software to click and drag a selection rectangle around the boundary of the desired target. The selection is approved and the measurement proceeds. 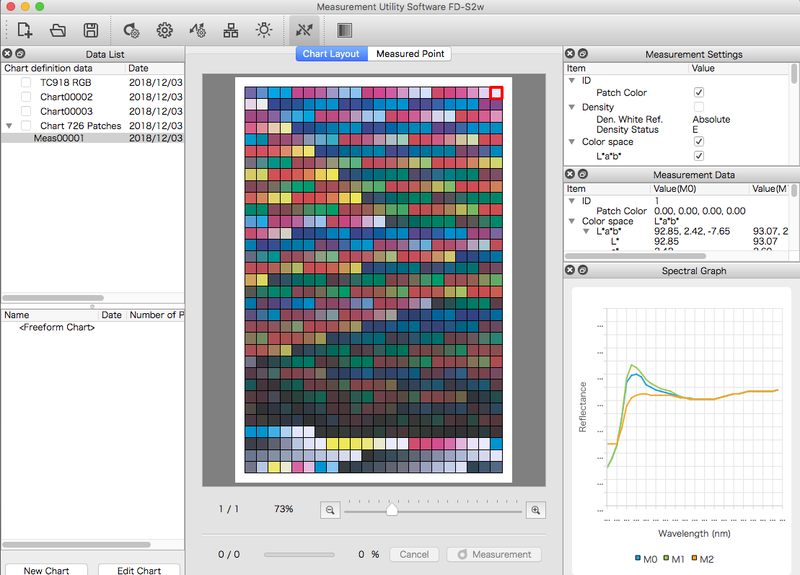 Consider an uncut press sheet that is crowded with several different kinds of charts and images on it. This can be fed wholesale into the FD-9, the user clicks and drags to select the desired chart, and it starts measuring from there. Pages can be fed in without cutting as long as they fit the 12-inch-wide limit. As we have been in the instrument-driving business the last few years, we tend to get picky when it comes to wanting user interfaces that are easy to use and still make full use of the device's abilities. 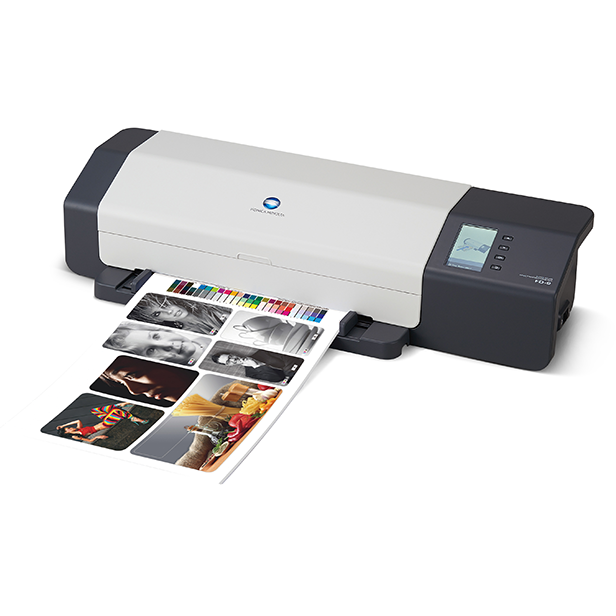 The FD-S2w software supplied by Konica Minolta is very powerful and capable, but it can be difficult to understand. Other software options on the market today have a more step-by-step approach to walking the user through the steps of making a new target, and many people prefer that approach, as it's easier for them to learn to use. The FD-S2w software certainly can get the job done by allowing you to create and measure targets, and it will allow charts to be measured even without a preset chart definition file. Perhaps the main purpose of the software is intended for the use of their own Konica Minolta printer customers, as it is directly compatible with many of their own presses. CHROMiX's own Curve4 software and our Maxwell Client also drive the FD-9 directly. To reduce the learning curve necessary to start measuring with this instrument, especially if you already use Maxwell or Curve4, either of these apps will make it very easy to start measuring with the FD-9. Our software will use target reference files you are probably already using from other programs. The Curve4 and Maxwell Client measuring modules (YouTube link) take advantage of the "auto-positioning" capabilities that Konica Minolta has developed. Auto Position will attempt to find the patches in your target automatically so you can skip the manual positioning step. If you have a lot of identical charts to measure that are located in a consistent location on their sheets, you can also take advantage of our exclusive Memory Scan option, which measures from a location on the sheet that you have pre-loaded into memory. This makes the selection of patches almost instantaneous, and measuring can begin almost immediately. The FD-9 can measure using M0, M1 and M2. The speed of the instrument is not affected by which mode is used to measure. The speed of the FD-9 tends to draw a crowd quickly when demonstrated at a trade show. It measures a chart surprisingly quickly. This is technically not a scanning spectrophotometer. Konica Minolta points out that it makes spot measurements, one at a time - it just makes them very quickly! You could call it a continuous single measurement instrument. Konica Minolta claims that this model scans twice as fast as the competitive models. This might very well be true, but keep in mind that there are some preliminary actions to click and drag around the target to identify the patches before scanning can begin. These extra steps will take up a few seconds, so this should be included in the overall time estimations when comparing the speed of instruments. The published spec reports .3 dE00 inter-instrument agreements and .05 dE00 repeatability. The Konica Minolta brand has a long history of making quality instruments. I would just point out that this is a different family of instruments than the X-Rite, Techkon, Barbieri, etc. family of instruments. It would be unrealistic to expect measurements from a Konica Minolta instrument to exactly match those of another brand. The nice thing is that with the FD-9 and the FD-7 hand-held units, you can be well-equipped with instruments that cover most of the measurement needs of a typical press room, and have a very high consistency of agreement with each other. There is temperature compensation built into the instrument, as normal temperature fluctuations can greatly influence measurement results on spectrophotometers. Konica Minolta also touts an "Auto-wavelength adjustment" which keeps these units in calibration over a longer period of time. The area that is measured is approximately 3mm wide. Konica Minolta requires a minimum patch size of at least 6x6mm for the FD-9 to measure accurately. This instrument weighs in at a pretty hefty 23 lbs. It's not the sort of thing you can slip into a carry-on bag if you travel a lot. If your idea of portability is along the lines of moving it around the office, then the built-in handles on each end work well to make lifting and carrying very secure. It is a nicely contained unit, without a lot of arms or appendages to make one nervous about breaking it. All of this speed and accuracy comes at a price. The FD-9 is $5700 at CHROMiX.com. This makes it more expensive than other single page chart readers like the iSis, but less expensive than table-based page readers like the Barbieri LFPqb. The FD-9 can detect QR codes, and we have used that feature in our own Maxwell software. If a QR code is included on a press sheet, the code is detected at the prescanning stage, and the code is used to automatically route the completed measurement to the track that follows the color on that press. There is an optional auto sheet feeder that can be purchased if you want to be able to feed a stack of test charts into the FD-9. There is no wireless connectivity available such as Wifi or Bluetooth. In addition to the standard USB port, it also has an ethernet port that enables connection over a network, and this might provide an easier connection for situations where a USB connection to a computer would be cumbersome - it works well for sharing between multiple computers, for instance. Note that the FD-9 measures in 10 nm increments from 380nm to 730nm. Some other chart readers have a more limited spectral range. Here is a Konica Minolta video about the FD-9. Here is the CHROMiX FD-9 ColorGear page. What's not to like about this instrument?! We would like it to be able to take M3 (polarized) measurements, but we always want that. If you have any doubts about the durability of this instrument, the Konica Minolta Sensing name should put you at ease. These folks have been making measuring instruments longer than most companies in the industry. In addition, the speed, convenience, and consistency of the instrument can keep your business and employees well-served and happy for years to come.